Please Join Us in Congratulating Edward Jones as January's Logan County Chamber Business & Entrepreneur of the Month. In 1914, Bellefontaine High School graduate Edward D. Jones Sr., left the Logan County area and eventually found his way to St. Louis, where in 1922, he founded the Fortune 500 Company of the same name. Today, this company has grown to include 14,000 branches across Canada and the United States. Logan County is home to three of those 14,000 offices, with two located in Bellefontaine and the third in Lakeview. The first Edward Jones office to open in Bellefontaine was opened in 1976 and was located on the street level of the Hilliker building right next to the Chamber Office. This first office has been a home to several advisors over the years, including Karen Medaris, Richard Harry, and currently Darin Olson. Darin's career with Edward Jones began while he was still attending Missouri State University in Springfield, Missouri where he worked with their local advisor. This advisor taught him a great deal about stocks and how the market worked. In 1989, after graduating from Missouri State University with a dual degree in Finance and Public Relations, he worked for Edward Jones as a transitional representative covering open offices around the country. He also worked at the home office in St. Louis in the Syndicate Department that did the underwriting of new stocks and bonds. 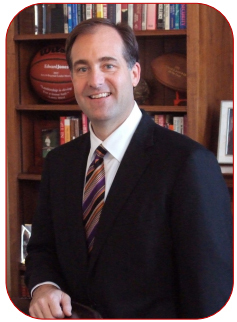 In 1990, he moved to Findlay, Ohio where he opened an office. In 1992, he was asked to move back to the home office in St. Louis to help develop the Midwest market. Then in 1994, when he and his wife, Jennifer, were expecting their first child and he was interested in reducing the amount of business traveling, they visited Logan County. They liked the area and felt that it would be a good place to raise their children and build client relationships. Bellefontaine became their new home. In 1998, Darin moved his office to its current location, 125 S. Main Street, replacing the Army Recruiter Office and began a complete renovation on the office. Darin was then instrumental in helping to train and start-up the two additional Logan County offices. First, training Frank Dietz, 12 years ago, who is the financial advisor in the Lakeview office and more recently, Colton Lowry, who is the advisor at 1400 S. Main Street, Suite A. As a full service investment advisor, Darin partners with his clients to organize, grow, protect, and distribute their wealth. With a focus on building strong client relationships and access to the latest and most sophisticated financial assessment software in the industry, he is able to work with his clients to help them reach their goals. Darin says, "Our objective is to take care of all things financial for our clients so they can focus on the more important parts of their lives." In addition to building strong client relationships, Edward Jones is one of the only national investment advisory firms serving individual investors that is employee owned. This important fact removes any pressure for advisors to be torn between a client's best interest and the interest of its shareholders, an important philosophy of the firm's founder. This strategic safeguard allows them to focus solely on helping their clients achieve financial success. Darin shares, "Our entire company is built around that aim. We do not have the distraction of other business interests getting in the way of serving our customers." Peter Druker, a world-renowned business consultant, was so interested in this unique business model that he volunteered his advisory services to the company for years. He is quoted to have said, "Edward Jones Investments looks like a company that was designed by its customers." 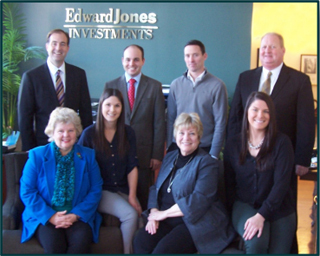 Edward Jones Investments has been recognized for many awards and notable accomplishments. They have been recognized by Fortune Magazine 17 years in a row as one of the "Best Companies to Work For." This includes a #1 ranking in 2002-2003, thirteen top 10 finishes, and six top 5 finishes. In 2014, Edward Jones was recognized as one of "Fortune 500's Largest Companies," with $6.3B in revenue. J.D. Power has recognized them multiple times for "Highest in Investor Satisfaction for Full Service Brokerage Firms." They were also a recipient of the "J.D. Power President's Award" for their commitment to excellence in client and financial satisfaction, a prestigious award only handed out 11 times in J.D. Power's 40 year history. Darin's office has enjoyed great success as well, ranking in the top 100 offices in the firm's 14,000 firm-wide offices. Darin has served 9 years as a Regional Leader for Edward Jones heading up efforts in central Ohio for the company and serving as a General Partner in the firm. At the end of this year, Darin will be stepping down from that role to focus solely on his clients needs. With over 90 years in business nationally, Edward Jones has had offices serving Logan County residents for 40 of them. As for his thoughts on the Logan County Chamber and his chamber membership, Darin had this to say, "Our chamber has worked hard to improve the economic climate of our county and its residents. As a chamber member, we support that effort that enhances, not only our business, but the quality of life in Logan County." We thank Darin Olson and the staff of our three Logan County Edward Jones offices: Frank Dietz, Colton Lowry, Rob Powell, Shari Stevens, Lisa Knight, Tammy Dunahue, and Stephanie Van Meter for their 40 years of service and commitment to Logan County and for their Chamber membership!